Your D5200 gives you the several ways to monitor critical picture-taking settings, including through the information display on the monitor and the data display on the bottom of the viewfinder. Press the Info button. Press once to display the screen; press again to turn off the monitor. Press the shutter button halfway and release it. Pressing and holding the button halfway down turns off the screen and fires up the autofocusing and exposure metering systems. Because those two systems use battery power, you may want to avoid this technique when the battery is running low. Press the Information Edit button. Note, though, that pressing the button a second time doesn’t turn off the display — instead, it accesses a control strip at the bottom of the display, which you can then use to adjust certain picture settings. To hide the Information display without activating the control strip, press the Info button. Viewfinder: You also can view some camera settings in the data display at the bottom of the viewfinder, as shown on the left in this figure. The information that appears depends on what action you’re currently undertaking. You can display gridlines in the viewfinder, as shown on the right in the figure, by visiting the Shooting/Display section of the Custom Setting menu and turning the Viewfinder Grid Display option to On. The gridlines are a great help when you need to ensure the alignment of objects in your photo — for example, to make sure that the horizon is level in a landscape. Battery status indicator: A full-battery icon shows that the battery is fully charged; if the icon appears empty, look for your battery charger. Your viewfinder displays a tiny low-battery icon when things get to the dangerous point. The icon appears just to the right of center in the settings strip at the bottom of the viewfinder. If the icon blinks, the battery is totally kaput, and shutter release is disabled. 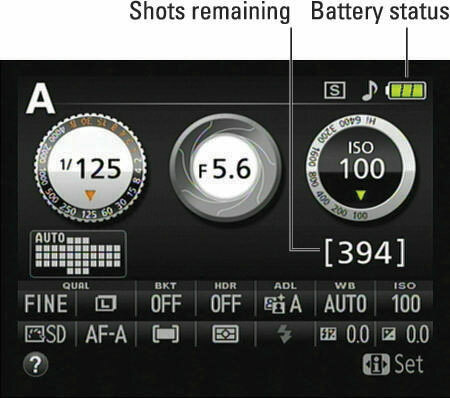 Just for good measure, the camera also displays a low-battery symbol in the image area of the viewfinder. Shots remaining: This value indicates how many additional pictures you can store on the memory card. If the number exceeds 999, the value is presented a little differently. The initial K appears above the value to indicate that the first value represents the picture count in thousands. For example, 1.0K means that you can store 1,000 more pictures (K being a universally accepted symbol indicating 1,000 units). The number is then rounded down to the nearest hundred. So if the card has room for, say, 1,230 more pictures, the value reads 1.2K.